It has been over a decade since the fans of Bradford City Football Club have had anything positive to cheer about, but that has all changed after arguably, one of the most memorable cup runs in the history of football. 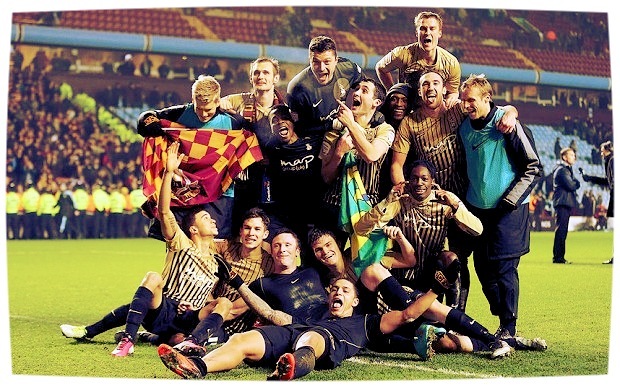 Bradford’s journey to the League Cup final has been one of the highlights of the 2012/2013 season as the League Two side knocked out three Premier League outfits in an amazing run of games that saw The Bantams make it all the way to Wembley. The first side from the bottom tier of English football to do so since Rochdale in 1962. Bradford’s success in this competition has been well documented by all the major newspapers, football websites and covered from just about every angle. 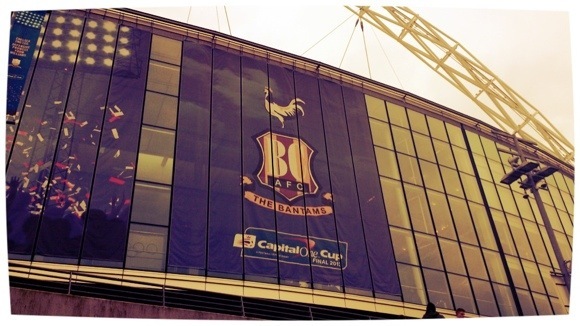 The Bantams have been dragged through years of hardship in recent times and as a Bradford fan I wanted to bring the whole experience together to show exactly what it means for the City to make it to the League Cup final. 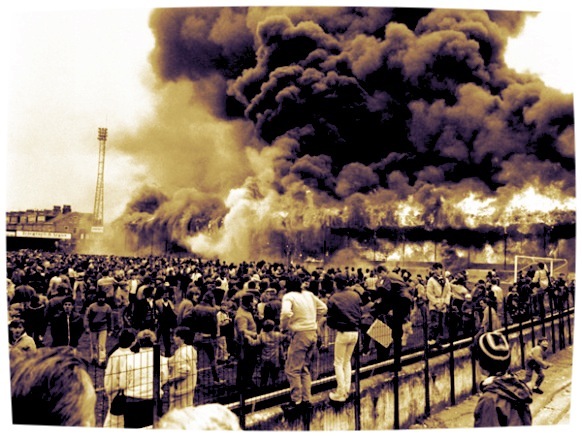 11th May 1985 was a very dark and horrific day for football, not just in Bradford but through the entire community associated with the game as 56 supporters perished in a fire that engulfed the main stand at Valley Parade. It was the final game of the season and Bradford had already laid claim to the Division Three title in a very successful campaign. Lincoln City were the visitors that day but after 40 minutes of the first half of the game the fire was already beginning to take hold underneath the main stand. The flames spread rapidly as the wooden stand harboured the fire; it is believed that a discarded match set alight a build up of rubbish underneath the stand itself. Spectators became aware of the impending danger and the whole atmosphere around the ground turned as fans feared for their lives. As the blaze took hold the fans spilled out onto the pitch to escape the burning heat. However, 56 people tragically lost their lives that day, 54 Bradford fans and 2 Lincoln supporters in one of English footballs darkest hours along with the Hillsborough and Heysel disasters respectively. The fire was one of the main protagonists behind the increase in safety around football grounds in the late 1980’s and the banning of wooden stands. It was a case of gross negligence (as with Hillsborough) as safety concerns had been raised on a couple of occasions previous to the disaster but nothing was done to tackle the issue of a build up of rubbish beneath the stand. Bradford City FC and the entire City of Bradford itself has bourn the physical and mental scars of the disaster ever since that fateful day in May 1985. The Cup final was an emotional event as the flag paraded over the Bradford fans before the game read “Always Remembered” in reference to those who tragically lost their lives. The players also wore tracksuits bearing the number 56 and the words “Always with us.” You can read in more depth on the stadium fire here. The BBC also featured a moving piece just before the League Cup Final from the City boss at the time of the fire, Terry Yorath documenting his experience on that day here. Since the turn of the century, Bradford have endured a meteoric fall from grace as they plummeted down the football league ladder, from the Premier League in 2001 to the basement division for the 2007-2008 season. 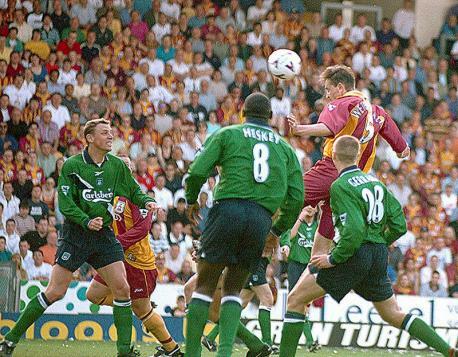 Bradford beat Wolves in their final fixture of the 1998-1999 season to finish second in the old first division and win promotion to the Premier League. With Paul Jewell as Manager, City had a memorable first season in the top flight which culminated as David Wetherall scored a header to beat Liverpool 1-0 on the final day of the season to ensure The Bantams survival in the top flight for another year. It was a great end to the season for Bradford as the benefits of Premier League football for another season would be one and many. However, the club was the victim of some horrendous mismanagement under former chairman Geoffrey Richmond, who in his self proclaimed “6 weeks of madness” effectively put the club into administration during City’s second season in the top flight. Richmond spent excessive money on the expansion of Valley Parade, which is now a 25,000 all-seater stadium and the signing of several overly expensive, high profile players with forecasted TV revenue money. These inlcuded former Scotland international David Hopkin, who cost the club a record £2.5m and Benito Carbone, who commanded wages of £40,000 a week. Although, I don’t think any City fan should hold this against Benny as the Italian left the club still owed thousands in unpaid wages. The club were subsequently relegated from the Premier League in 2001 after a poor season both on and off the pitch. They were twice put into administration during their fall from grace and were sitting on the brink of liquidation before being rescued in August 2002 by Gordon Gibb & Julian Rhodes. After initially steering the club clear of the first financial crisis, Gibb resigned in January 2004 and the club fell back into the darkness of the administration. It was not until June 2007, when Bradford business man Mark Lawn provided the money to pay off the clubs bank debts; taking on the debt himself as co-chairman with Julian Rhodes, before Bradford’s off-field problems began to dissipate. Since then Bradford continued their descent to the bottom of League Two as they tried to recover from the crippling financial crisis. The club spent several seasons languishing close to the bottom of the basement division but narrowly maintained their Professional league status. Current manager, Phil Parkinson has been in charge since August 2011 and was appointed after a string of high profile managers failed to improve City’s fortunes. These included Bradford legend Stuart McCall, former Hull City, Crystal Palace, Wycombe Wanders and England Under 21 manager, Peter Taylor as well as seasoned football league manager Peter Jackson. All of whom brought about a complete squad revamp with players coming in and out of the team through the proverbial revolving door. However, Parkinson has begun to build a Bradford side that looks capable of living up to the bookmakers and the fans expectations this season as they have found themselves on the brink of the League Two play-off positions. Although the glory days of the Premier League are now long gone for Bradford, the loyal and passionate fan base has been crying out for success since the clubs demise. The 2012/13 League Cup competition provided the platform for success and a source of joy for the supporters. 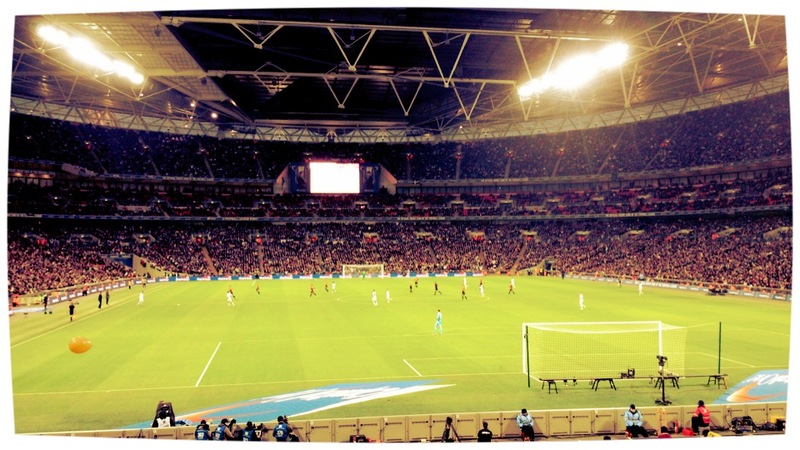 The 2012/13 League Cup competition brought some much needed relief from Bradford’s years of plight with one of the greatest cup runs in recent history, culminating a trip to the Home of Football, Wembley Stadium. Round One of the competition saw Bradford face League One side Notts County. A relatively poor opening game saw Matt Duke deny County on several occasions and the stars seemed to be shining on City as an unbelievable miss from Yoann Arquin, who hit the bar from three yards kept the scores level. The tie subsequently went to extra time and it was James Hanson who scored a curling effort from the edge of the box in the 95th minute to put The Bantams through. 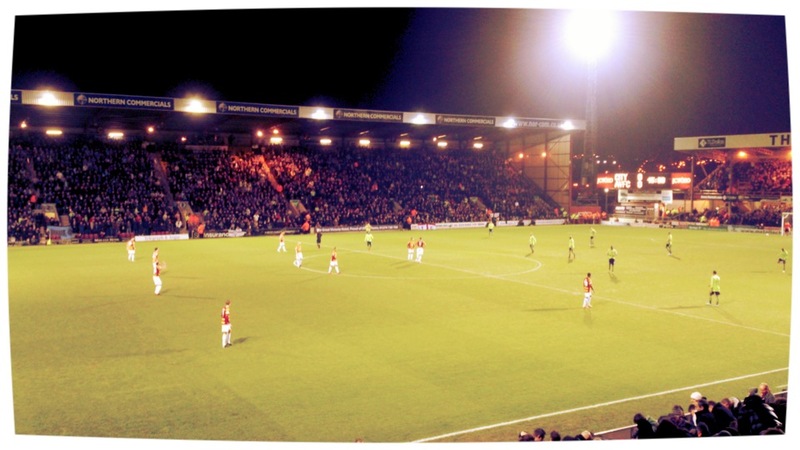 City faced a tough away trip to Championship side Watford in Round Two and The Bantams were once again the underdogs. Watford took the lead in the second half through Ikechi Anya but Kyel Reid pounced on a failed clearance to equalise on 84 minutes. The tie seemed to be going to extra time in consecutive rounds but Garry Thompson popped up in added time to send City through to the Third Round with a 1-2 victory, knocking out the biggest opposition so far. League Two rivals, Burton Albion were the visitors to Valley Parade in the Third Round of the competition. Albion were two up at the half time interval and almost out of sight thanks to goals from Billy Kee and Aaron Webster. The game seemed to be completely beyond Bradford. 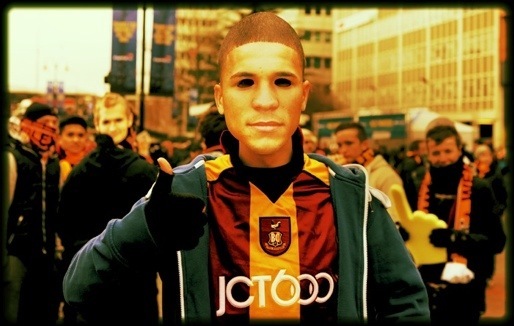 However, Nahki Wells scored a brace in the final 8 minutes of the game to take the tie to extra time. Former Liverpool full back Stephen Darby stepped up with 115 minutes played and fired a long distance striker into the bottom corner of the goal to send City through to the Fourth Round. At this point there was a very real possibility of drawing a Premier League side and the fans waited with baited breath for the draw. Bradford’s first appearance in the Fourth Round of the League Cup since 1988 saw the Yorkshire side travel to Wigan Athletic. The underdogs put in another solid performance against Premier League opposition. It was down to sheer determined defending from the City players and a few pieces of luck along the way as Mauro Boselli and Jordi Gomez wasted good opportunities to put Wigan ahead. After 120 minutes of play the two teams could not be separated and penalties would decide which team take their place in the Quarter Final. Nathan Doyle, Gary Jones, Stephen Darby and Alan Connell all found the net from the spot for Bradford but Shaun Maloney fired his effort over the cross bar before Matt Duke pulled of a great save to deny Jordi Gomez. Bradford went through to the Quarter Final after a 2-4 penalties victory. However, it will be the games against Arsenal and Aston Villa that will live longest in the memory of football fans around the country. 23,971 fans attended the quarter final tie against The Gunners, the biggest crowd seen at Valley Parade since the 1960’s. A similar crowd of 22,245 was recorded at the semi final first leg tie against Aston Villa at Valley Parade and another 6,500 travelled to Villa Park for the second leg. 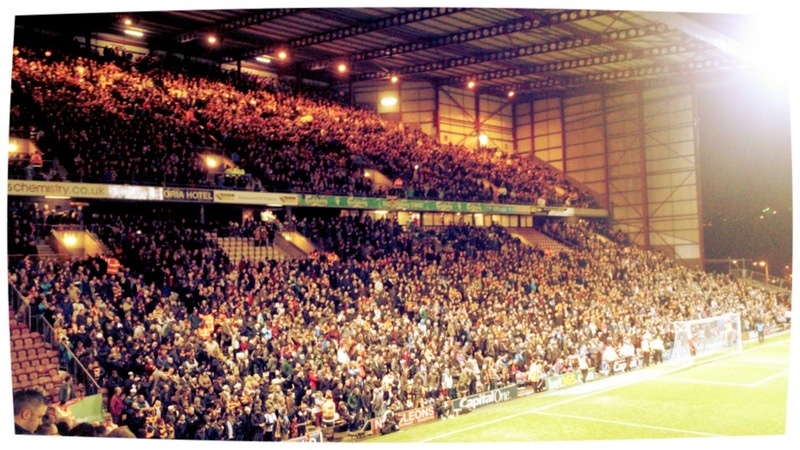 Bradford are one of the best supported clubs in the Football League and the City fans did everything to enhance this reputation during the televised ties against Arsenal, Aston Villa and Swansea. Arsene Wenger put out a very strong side as The Gunners starting eleven was strewn with high profile, international stars such as Lukas Podolski, Santi Cazorla and Thomas Vermaelen. The Arsenal manager clearly saw the League Cup as a competition that Arsenal could win to cure the trophy drought that has hung over Arsenal since 2005. However, the Bradford players were not over-awed and rose to the occasion as Garry Thompson volleyed home on 16 minutes to take a shock 1-0 lead. “You’re getting sacked in the morning!” rang out around Valley Parade as a dejected Arsene Wenger patrolled his technical area. The tireless work ethic from Bradford was impressive, especially as Arsenal dominated possession for long periods of the game. The Bradford defence was top class; in particular Carl McHugh and Rory McArdle, who remained solid in the centre of defence, performing like an experienced Premier League partnership. Matt Duke also came to the fore with several smart saves in the first and second half as well as in the penalty shoot out. Phil Parkinson set up his team to frustrate Arsenal, whilst remaining disciplined and strong defensively they could also threaten The Gunners on the counter attack with the pace of Nahki Wells and the physical presence of James Hanson from set plays. The early goal did wonders for Bradford’s confidence and Arsenal couldn’t break The Bantams down with any success until the 88th minute when Thomas Vermaelen headed home a Cazorla cross at the back post. The late equaliser was a blow for Bradford, who were only two minutes from a victory in normal time and I think anyone could have forgiven the League Two side had they capitulating during thirty minutes of extra time. It was not to be for North London side as extra time passed without a goal and penalties ensued. Bradford’s unblemished record from the spot would be put to the test. After seven penalties from both sides it was left up to Thomas Vermaelen, to take Arsenals final spot kick and take the shoot out to sudden death. However, the Arsenal captain’s penalty struck the post and Bradford’s ninth successive shoot-out victory sent Valley Parade into rapture and a semi final tie against Aston Villa. Bradford’s first semi final for many, many years saw them take on Premier league Aston Villa and the underdogs put in another heroic performance, in a game that will be forever remembered when a League Two side put three past a Premier League team. Bradford managed to weather the early storm after a promising start by Villa as Matt Duke showed exceptional form to deny Christian Benteke and Gabby Agbonlahor. Bradford showed desire and determination got back into the game and it was the pacey, Bermudan forward, Nahki Wells who opened the scoring for Bradford on 19 minutes. Zavon Hines’ deflected effort fell kindly into his path and the 22-year-old provided a composed finish into the bottom right hand corner of Shay Given’s goal. Bradford took the 1-0 advantage going into the half time interval. Villa boss Paul Lambert clearly vented his frustration to his team at half time as the Midlands side flew out of the traps at the start of the second half. A resilient Bradford took the initiative and doubled their lead as Rory McArdle attacked Gary Jones’ cross to head home a powerful effort from close range. Minutes later, James Hanson almost put The Bantams 3-0 up as his header crashed off the cross bar. Paul Lambert made one attacking change as Darren Bent replaced Gabby Agbonlahor, however, the England forward missed a guilt-edged opportunity after his arrival. Bent lasted less than half an hour before he had to be subbed off, seemingly succumbing to an injury picked up after a clash with Matt Duke. Andreas Wiemann managed to capitalise on a rare defensive error by Bradford when Carl McHugh failed to deal with Christian Benteke’s flick on. However, it was the young Irishman who scored Bradford’s third goal. Once again, Gary Jones put in a fine delivery from a corner and McHugh managed to elude his marker to guide his header exquisitely past his fellow countryman, Shay Given in the Villa. And so was another major upset, a very convincing 3-1 victory had given Bradford fans real cause for celebration and dreams of reaching the League Cup Final were close to a reality. Despite Bradford’s two goal advantage going into the second leg; Villa were still the overall favourites to progress to the final. The Villains exceedingly poor league form placed all the pressure squarely on the shoulders of manager, Paul Lambert and his players. Even though Bradford’s own performances in League Two had been sub-standard for the majority of January, coming into these cup games as underdogs had really worked in their favour. The Premier League side welcomed the return of Ron Vlaar to their defensive ranks, who was tasked with curing Villa’s exceptionally poor defence from set pieces. Other than the Dutch centre back and Stephen Ireland, there were no notable changes to Paul Lamberts line-up. Phil Parkinson on the other hand decided to go for the exact same starting eleven that had done so well to record a 3-1 victory in the first leg of the semi final. 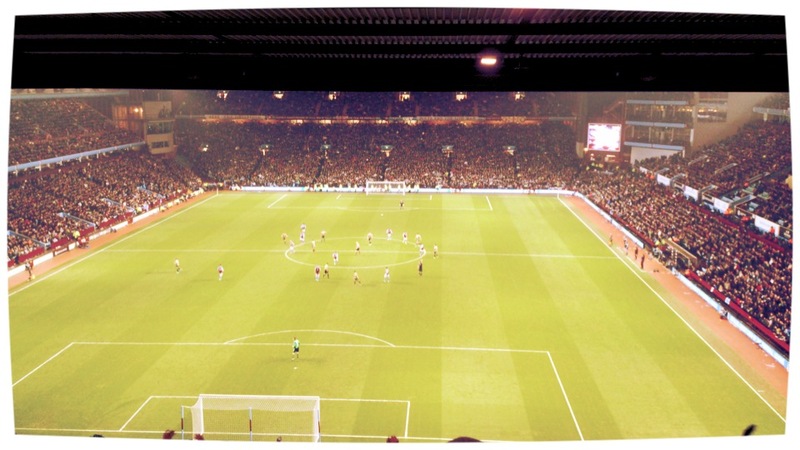 The atmosphere inside Villa Park was intense both from the home supporters and the travelling City fans. There was a real feeling of anticipation ahead of the game and Villa came out of the blocks at great pace with a point to prove. Bradford endured severe pressure for the first 20 minutes before Villa’s superiority finally yielded a break through. Christian Benteke connected with Joe Bennett’s near post cross to stab the ball on the volley past Matt Duke to reduce City’s lead to one goal on aggregate. Nahki Wells had the only real opportunity for the visitors as he cut inside on the edge of the Villa box and saw his effort curl just wide of Shay Givens far post. Bradford managed to make it to half time at 1-0. City’s goal had lead a charmed life for the majority of the game and another Villa storm at the start of the second half somehow didn’t produce a goal. Set pieces proved to be Villa’s downfall yet again and provided Bradford’s best opportunity to fashion a chance. Ten minutes into the second half, a Gary Jones corner was met by James Hanson, who managed to lose Ron Vlaar inside the box to convert a powerful header which levelled the scores on the night. As a Bradford fan who was there that night, it was a euphoric moment as local boy, Jimmy Hanson effectively put Bradford through with that header. I have never celebrated a single goal so much in my life. Villa did retake the lead on the night through Andreas Weimann, who latched onto Christian Benteke’s flick on, round Matt Duke and slot the ball into an empty net to make it 2-1 (3-4 on aggregate). Villa’s overall attacking play left a lot to be desired as even with four strikers on the pitch Bradford coped well with the Premier League side. Weimann’s goal on 88 minutes set up a nail-biting period of added time. When Phil Dowd blew the final whistle after 95 minutes of play there was a brief pause around Villa Park and a sense of disbelief amongst the Bradford fans. The fact that a collection of free transfers, loan players and one ex Co-Op epmployee had made it to the final of a major competition was nothing short of miraculous. The away fans burst into euphoria and sang until Villa Park was empty, the players saluted their support and gave interviews for the Sky camera’s on a historic evening as the fourth tier minnows had made it to the League Cup final. Bradford’s reward for their string of fantastic performances against a number of Premier League football clubs was the showpiece final at Wembley Stadium against Michael Laudrup’s Swansea City. The Welsh side had also beaten several high profile teams to get to the final and The Swans are fast becoming one of the best and most attractive footballing sides in Europe. There was something special about this particular final and as Laudrup himself put it; it was “The underdogs versus the under-underdogs.” The two teams battling for the trophy had essentially passed each other on opposite sides of the road in the space of a decade. Swansea on the journey to the promised land of the Premier League, meanwhile Bradford went from the pinnacle to the basement of professional football in the same period. The one common denominator was the fact that neither side had been expected to make it all the way to the final of the competition, which is usually contested by one of the fabled top 4. Almost a slap in the face to the corporates of football and their growing dominance, this unexpected final provided a lease of life for the game and refreshed the appetites of football fans around the country. 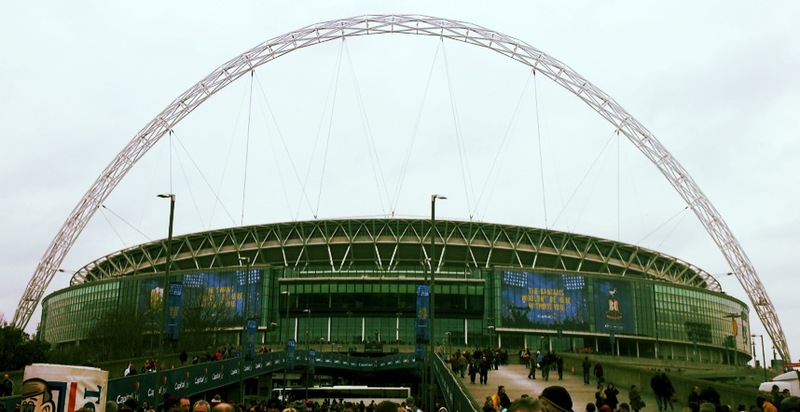 The atmosphere at Wembley Stadium was unique as tens of thousands of Bradfordians flooded the capital to support their side. In my (biased) opinion, the essence of Yorkshire has been sorely missed from the top flight matches in recent years as not a single side from the county compete in the Premier League, which has really been the culmination of years of economic decline in the area. It was the sort of atmosphere that a lot of Bradford fans had never experienced before and a once in a lifetime opportunity for a club from League Two. This was The Bantams first visit to Home of Football since the Play off final of the old Second Division in 1996 and their first ever trip to the ‘new’ Wembley. A claret and amber sea engulfed Wembley Way and the cup final atmosphere began to take off as the big kick off approached. Many of the Bradford faithful were jubilant before the game and why not? Phil Parkinson’s men had it all to play for and rather than “park the bus” (excuse the cliche), there was hope amongst City fans that their beloved Bradford would try to play the controlled and disciplined football they had shown in the past rounds. The Bradford players had already made heroes of themselves by simply making it to this stage of the competition but could they come to Wembley and play football without fear or doubt; in the face of one of the best teams in the Premier League, on the biggest stage of English football? The short answer was no, from the very first whistle to the very last, Swansea dominated the game. Laudrup’s side maintained possession and knocked the ball around the pitch with ease for the majority of the game, finding pockets of space to exploit between the Bradford midfield and defence. Amongst all their top class play, Swansea managed to find the back of the net twice in the first half. Nathan Dyer opened the scoring as he capitalised on a Michu shot which was spilled by Matt Duke on 16 minutes. The Spaniard then added himself to the score sheet from a similar position to his earlier chance, but this time his effort nestled in the bottom corner just before the half time interval. Bradford just didn’t start as they had done against Arsenal and Aston Villa. The Bantams seemed to be overawed by the occasion, failing to press Swansea when they had the ball and not pushing up out of their own half of the field. There was no outlet when they had possession with James Hanson cutting a lonely figure against the dominant Ashley Williams and Ki Sung-Yeung. Nahki Wells could have been made use of the large Wembley pitch with his pace but he did not get the service he needed to stretch the Swansea defence. The Bermudan forward looked pretty despondent up until he was substituted. Although, I believe it was just a case of nerves in the face of the big occasion rather than lack of desire or the wrong tactical approach. Swansea picked up where they left off at the start of the second half, dictating the pace of the game and pulling Bradford around the pitch at will. The constant pressure from the Welsh side took its toll almost straight away as Nathan Dyer managed to score his second goal of the game to effectively decide the destination of the trophy after 47 minutes. However, that was not to be the end of Bradford’s woes as goalkeeper, Matt Duke brought down Jonathon De Guzman to concede a penalty and collect a harsh red card. De Guzman duly applied the finish from the spot to make it 0-4. Down to ten men and with a four goal deficit to make up, Bradford kept going right until the bitter end. Swansea’s final goal came in stoppage time as De Guzman grabbed his second of the game to make it 0-5. The Bradford supporters were in terrific voice all afternoon and were the highlight of the entire game, even at 0-4 and 0-5 down they continued to cheer on their team of heroes who had done so well to get this far. For the final twenty minutes of the game the claret and amber flags were in full force and the Yorkshire accent sounded out strongly around the ground. 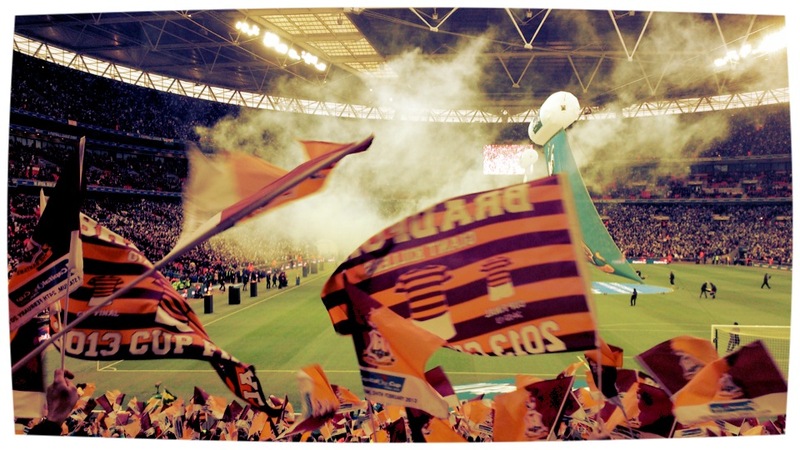 It was a privilege to be one of the Bradford fans their on that day, despite the result it was a proud moment to see The Bantams walk out onto the hallowed, Wembley turf to take their place in the football history books. What I will say is that it has been a once in a lifetime experience for everyone associated with Bradford City and the statistics say that nothing like this should ever happen again in football. A side from League Two has almost no right to get this far in a major competition and just to be there at Wembley, and even Aston Villa, Arsenal and Wigan before hand is a miraculous achievement in itself for such a small club from League Two.